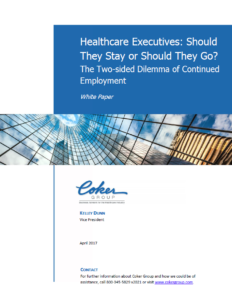 Executive retention is one of the most important tenets of an organization, particularly at a time when the talent pool is stretched thin across the healthcare industry. In addition to identifying and hiring the right person, it is equally essential to coach the executive to perform at the highest potential and to explore areas of dissatisfaction. Your greatest and most valuable investment are your leaders. As a leadership team is often only as good as its weakest member, it is equally important to evaluate and determine when it is time to let go. This paper discusses when and why it may be time to change leadership. It considers the high cost of turnover and the value of focused executive coaching to retain tenured executives. Additionally, it examines the importance of having leadership who fit personally, professionally, and culturally in your organization. Employers must ask themselves questions about potential costs, long-term performance, and organizational morale. If and when a decision is made to dismiss an executive, it is crucial to have a replacement plan in place.